Anna Mary Robertson was the third child born into the Robertson family in 1860. Her parents were farmers raising a brood of ten children. Money was scarce and when Anna was 12 she became a hired girl to help another family. Her schooling was limited. When it was cold in the winter little girls did not attend school very often, but when she was working as a hired girl she was allowed to attend school with her employer's children. She worked hard all the time she was growing up, then when she was in her 20's she married a man named Thomas Salmon Moses who was also a hired worker. The couple moved to Virginia where they rented farms and worked the land. Ten children were born to them, but five of them died when they were babies. Eventually they returned to New York state and bought a farm. At this time she was called Mother Moses. She could do many things and enjoyed doing needlework such as sewing and embroidering. With needle and thread she would make pictures on the fabric, but she had arthritis and it hurt her hands to push the needle through the material. When she was in her late seventies she decided to take up painting which was easier on her hands than needlework. Her first painting was made using housepaint. Her art might be classified as folk art which is self-taught art. A folk artist doesn't go to school to learn how to paint or study with another artist. Grandma Moses fits this category of artists. Sometimes it is called "primitive" art. Many of these artists began painting when they were senior citizens. 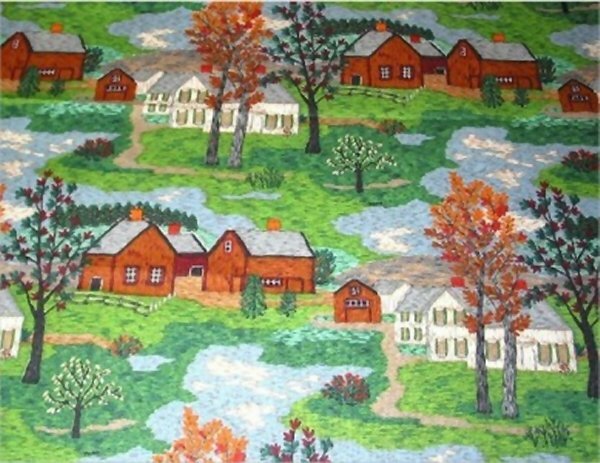 Grandma Moses was in her 70's before she began to paint seriously. Sometimes she added glitter to snow scenes, contrary to what many considered artistic. She painted simple pictures, scenes of family, church, and community extolling the virtues of honesty and hard work which made America great. She was an excellent example of these virtues. She painted many pictures of the Hoosick Valley in all seasons. One view of the valley called Hoosick Valley (From the Window) was the view she saw as she looked from her window. (Go to the link and scroll down) White curains frame the scene. She didn't use an easel, but painted at an old kitchen table she had put in a utility room. This was her studio. Most of her paintings depicted scenes from upstate New York and Vermont. Several paintings show a "checkerboard house". Click on the link and scroll down to see Checkered House. There really was such a house which dated back to the Revolutionary War. It had been painted in a checkerboard pattern. She painted scenes familiar to the farm life. Her paintings told stories about applebutter making, making soap and maple syrup, husking corn, and making candles. The Quilting Bee (go the link and scroll down) shows how women would meet and visit while they made quilts. Sometimes they made a "friendship" quilt where each member contributed a square to the project. County fairs and joyous times were immortalized in her works. Holidays such as Christmas, Thanksgiving, and Halloween were some of her favorite subjects. A few of her works illustrate rhymes or stories such as Mary and Little Lamb andLittle Boy Blue. In 1938 she has some pictures displayed in a drugstore window when an art collector from New York happened to see them. The story is told that Anna Mary's daughter-in-law told the man Grandma had ten more paintings she might sell. When she and Anna Mary counted the paintings, there were only nine, so Grandma cut a large picture in half and reframed it into two pictures to make the ten paintings. The man, Louis Caldor, who was a civil engineer and an art collector really liked her work. He bought several of her paintings. He also helped her by buying some art supplies for her and he used his influence to market her work. He asked someone to display some of her pictures in a collection called "Contemporary Unknown American Painters". Nothing happened as a result of that showing. Then he introduced the owner of Galerie Saint Etienne to her works. Otto Kallir arranged a one-woman show for her and exhibited her paintings in his New York City art gallery. The exhibit was called "What a Farm Wife Painted". Grandma appeared in person at an exhibit at Gimbel's department store. People were charmed by her honesty and simplicity. She was very down-to-earth and unpretentious. She once told a reporter, "If people want to make a fuss over me, I let 'em, but I was the same person before as I am now". When she was younger Anna made pictures out of yarn. When looking at her textile pictures you can see how they relate to her later efforts with paint. Her textile picture of Mt. Nebo has been made into fabric. She viewed her art as something she enjoyed doing and it provided some extra money. She couldn't fathom why people paid such high prices for her pictures. 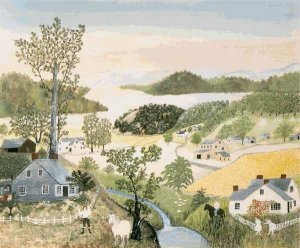 By the time she was 80 years old, many people had heard of "Grandma Moses" and had seen her paintings. Paintings which she first sold for about $5 later were sold for $8,000 to $10,000. She appeared on the Edward R. Murrow television show and showed people how to paint a picture. She enjoyed phenomenal success. She was honored by presidents and governors. Several books have been written about her. 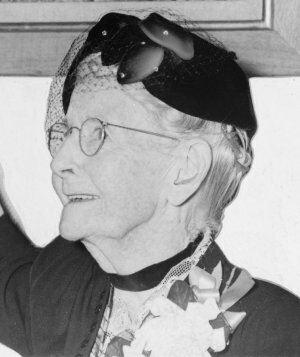 A "Grandma Moses Day" was proclaimed in New York. Her picture appeared on the cover of Time magazine in 1953. She painted many pictures during her lifetime. Though she was a religious person she did not do religious paintings. When she was 100 years old she painted illustrations for "Twas the Night Before Christmas". She died at age 101. Her obituary appeared in the New York Times in December 1961. Ketchum, William C. Grandma Moses, An American Original. 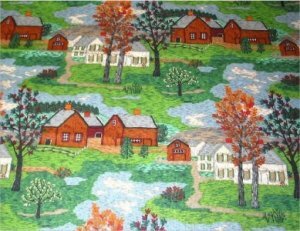 New York: Grandma Moses Properties Co., 1996. Press "Go" to search for books about Grandma Moses. 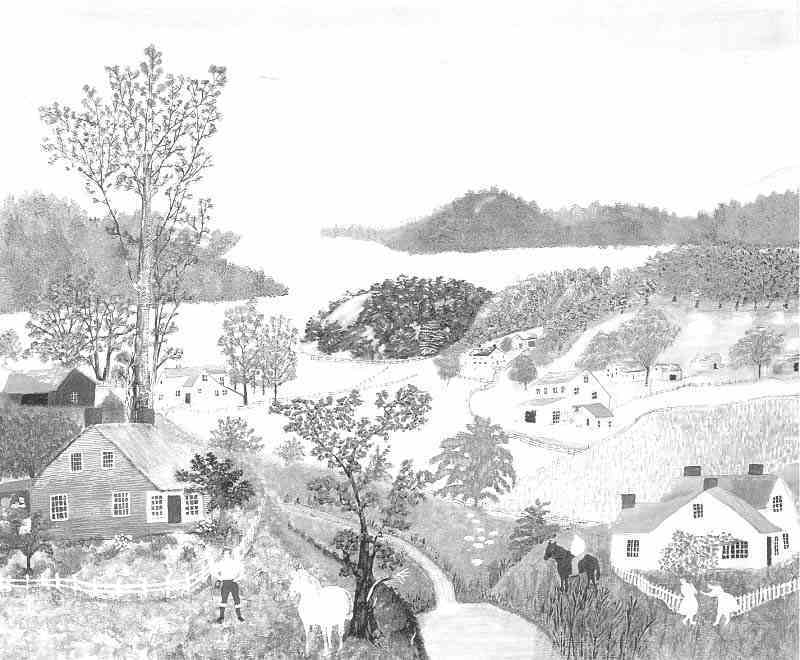 What were the last prices paid for Grandma Moses paintings? I have an original Grandma Moses and need information as to where I can sell this painting. It is a winter scene. I would like to send you a picture. Thank you for fixing the Grandma Moses page. i just love her paintings they are so cool..... got to go love always Areli! Ii just love this site. Monet's Bio appear on the print this webpage for Grandma Moses. Thank you. This page displayed 243,673 times.